“I can’t lose weight, with my babies I don’t have time for exercising” – we all use this excuse! For many moms it is difficult to get back into shape when they have one kid, with two or more children it may even seem impossible. However, there is an awesome and fun way to lose weight after pregnancy and stay active with babies – jogging with a stroller! Here I present you one of the best joggers that can help you get your body back – BOB Revolution FLEX Duallie. BOB Revolution FLEX Duallie is a perfect double stroller for daily use and unusual adventures! It is designed for parents of twins or kids of small age difference, since it can accommodate an infant in a car seat and a toddler. This stroller is easy to navigate and very maneuverable. It is made of high quality materials and fabrics and still quite light as for a double jogger! BOB strollers are very similar to each other and no matter which one you choose it is very unlikely you will be disappointed. But of course they have little differences and features that could fit you less or more. BOB Revolution FLEX Duallie Stroller has lots of awesome features for your and your passengers’ comfort and safety. This double jogger will definitely satisfy active parents and those who are trying to get back into shape. This stroller is double side-by-side, therefore kids sit next to each other. Each seat reclines individually. This is a huge advantage, especially when you want to stroll with an infant and a toddler. One baby can sleep reclined and the other one can sit up and be involved in the action. Both seats tilt back to 70 degrees from vertical. In the newest model (2016) recline is much better – there is a buckle that you need to squeeze and pull (which can be done with one hand). Moreover the child can sit almost completely upright when the seat is not reclined. There is one more great thing about the seats – each has a vented top, so when the seat is fully reclined the mesh top provide nice extra air-flow. On more windy days you can easily close it with a cover. Seats cannot be fully reclined which is good, because it would be not safe to run or hike with your little passengers sleeping flat. However, thanks to this recline mechanism you can set the seat back at any position (infinite recline). The seats have ultra-padding for your passengers’ comfort. The fabric is water resistant which is great because during strolling or running something always spills out. Seats will often get dirty with your babies food or drinks, but you can easily clean the fabric with water and soap. Each seat is 12.5” wide and can accommodate a child up to 50 lbs. The producent says it can be used for babies from 8 week, but remember to use an infant car seat with an adapter. The jogger seat is proper for child with head and neck control, who can sit up. Although BOB Revolution FLEX Duallie does offer really nicely padded leg rest which gives plenty room for both babies and quite large footrest, I wish the leg rest was adjustable. This model is equipped with adjustable safety straps. It has crotch and shoulder height adjustment options. The straps can be adjusted in all five points. The harness is easy to put on and take off. The release button is in the middle and can be used with one hand. The strap are nicely padded which gives your babies more comfort. There is one thing I really didn’t like: a strap between seat bottom and leg rest because it is made of rougher fabric than the seat or leg rest itself and it could potentially cause discomfort for babies because it can rub on their sensitive skin. Of course I’m not sure this will definitely happen, but if you consider this model you should be aware of that. You can also turn this stroller into a travel system and attach one infant car seat. It’s great solution for parents who have an infant and a toddler/preschooler. This jogger is compatible with Britax, Chicco, Graco and Peg Perego. Adapters are sold separately and usually cost around $80-$90. According to the manufacturer BOB FLEX is suitable from 8 weeks. In my opinion it should be used only for children who can sit unassisted and hold their head up (around 6-8 months). Parents should run only with children who have developed neck and head control. I think it is more safe that way. 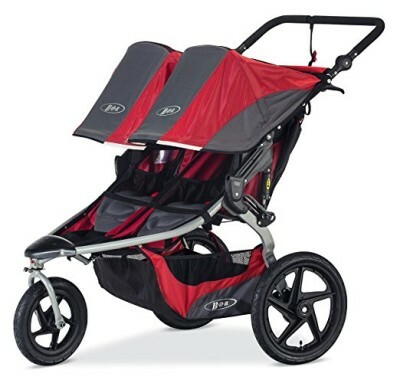 However, you can use this double jogger earlier – with one infant car seat. But I think it is not safe to run with a newborn in a car seat (it may have negative impact on his delicate spine and neck). You should rather wait until your baby can use the regular seat. Of course you can do whatever you want, this is only my opinion. 🙂 To be sure if you can start running with your babies, you should consult your pediatrician. Each seat has its own five-position sun shade and you can set them independently, which is great when one of your passengers falls asleep or is sensitive to sun, and the other one wants to explore the surroundings. All BOB models have great canopies that give your passengers excellent sun protection. They are large and go really far down and cover babies down to the knees.. Canopies are made of water resistant material which is very handy when it starts to rain while you are jogging. 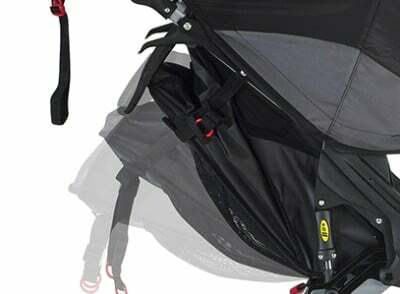 Each canopy has peek-a-boo window so you can check on your little passengers during strolling or jogging, no matter at what angle the seats are reclined. Notice that peek-a-boo windows are not mesh, but plastic and close with Velcro. I’m not a fan of this closure, it can be noisy. You can also spy on your babies through additional mesh window on the top of each seat (in reclined position). These vented tops also provide great ventilation. I really like that this double jogging stroller has adjustable handlebar (although I wish it was telescoping, not rotating). The handlebar goes from 33.5” up to 50.5” so it’s can accommodate literally all parents: those who are very short and those who are really tall as well. Big plus for FLEX. This wheels set BOB apart from much of the competition. They are made of high impact polymer. The rear wheels are bigger (16”) and wider and will handle any type of terrain and curbs. The front wheel is 12.5” and can be set fixed or pivoting. The wheels are removable which makes the stroller more compact and easier to storage or transport in a car trunk. The tires in BOB Revolution FLEX Duallie are air-filled and you can use normal bike pump for them. You can set the front wheel in two positions. 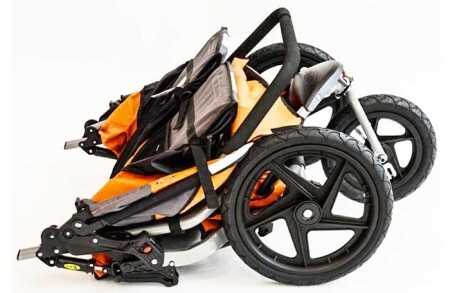 Swiveling wheel makes the stroller more maneuverable and very easy to navigate. This option is the best for smoother but crowded or narrow surfaces. You can also lock forward the front wheel to increase the stability. It is the best for jogging or walking on rough surfaces like bumpy unbeaten terrain. The wheels are really awesome and they won’t let you down on the sand, mud or snow. I’ve read in other parents reviews that some of them have taken it even to the sandy beaches and it hasn’t gotten stuck! Like every other BOB model, this one also has excellent suspension system. 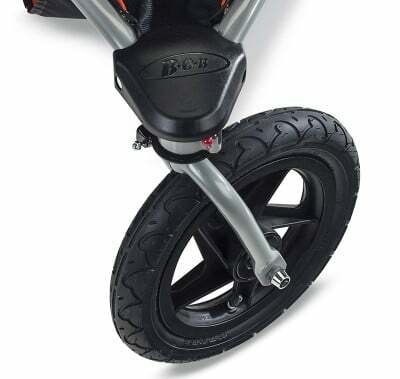 Thanks to it your baby won’t get bumped around, even during riding on harsh terrain. With this stroller you can go over cracked sidewalks, cobbled streets, dirt and unbeaten roads, wooded trails and gravel, literally any type of terrain. The suspension system is adjustable and has two-position shock absorption which increases driving comfort for the little passengers. Moreover, thanks to so smooth and cushioned ride your children are protected from spinal diseases. BOB proves that even double side-by-side stroller can be easy to push and very maneuverable. This model operates easily even on dirt or wooded trails and easily takes even tight corners! This brake, like in other BOB models, is places between rear wheels, on the rear axle. The new model of FLEX Duallie (2016) has flip flop friendly brake, much more easy to press and lift with the bottom of the foot than in pre-2016 models. Once the brake is set, the stroller is immobile, until you intentionally release the brake. Unfortunately this stroller doesn’t have hand brake, which is actually necessary during running down the hill. 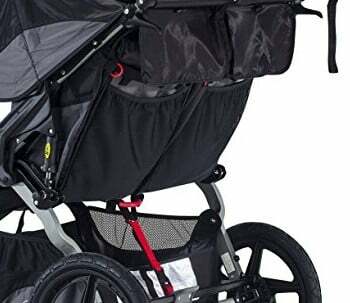 If you plan to use your jogger in a hilly area I would recommend you another BOB double jogging stroller – Revolution Pro Duallie 2016, which has additional hand-operated brake. There is one for safety feature – a wrist strap. 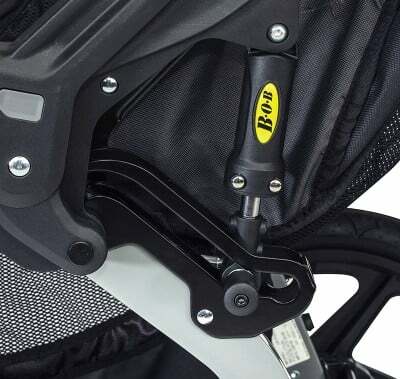 Thanks to this safety strap you can be sure that the stroller and your little passengers won’t run away from you. 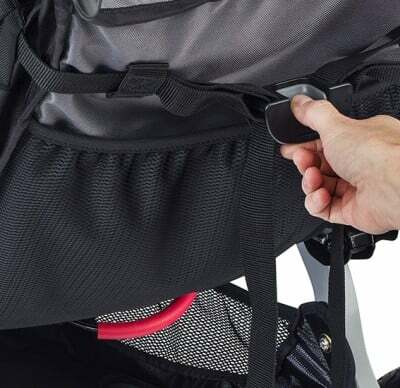 The strap has also a lock which you need to use to keep the stroller in closed position. The wrist strap is attached to the handlebar. I really love this about BOB! In each model there is a lot of room for all the things you will need to take with you for your babies when you leave the house. This model has HUGE basket underneath the seats so you don’t need to worry where to keep your children’s things or shopping bags. There are also two mesh pockets inside each seat where you can keep some toys, snacks or sippy cups for your passengers. On the back of each seat there is an additional mesh pocket where you can put your cell phone, keys, wallet or a bottle of water, since there is no parent console included. Notice: the pockets are placed on the back of the seats which are reclining, so it can be a little difficult to access them when the seats are fully reclined (fully in this stroller means 70 degrees from vertical). You can purchase parent tray separately and it is very useful because it is equipped with very useful cup holders. There is also a small closed pouch for your valuables. I always wondered why BOB joggers don’t have cup holders – which is essential when you are jogging and you need to keep a bottle of water at hand. Reaching for water to the back pocket can be difficult and not very safe because you can easily trip up. If you want a cup holder you will need to purchase a handlebar parent console which is has two cup holders. Fortunately they are placed in a safe distance from your precious cargo. Let’s face it. This is a double jogging stroller so it is big and heavy. I’m aware that it can be bulky for some parents. However, I’m a petite woman I’ve never had problems with handling it or lifting to the car trunk. The frame is made of durable but light material. BOB Revolution Flex double stroller weighs 33.1 lbs. It is a heavy duty stroller, it has to be strong to accommodate two passengers. Keep in mind, that it can hold up to 100 lbs and it’s suitable for older toddlers or even preschoolers! In my opinion, the stroller weight is adequate for what it offers. The whole stroller is 30.5” wide so it’s definitely not tiny, however you shouldn’t have problems with fitting through normal doorways or elevators. Like every other BOB model (double and single), this one has also two-step folding which allows you to transport or storage the stroller in your car trunk. To make it more compact we can take off the wheels. 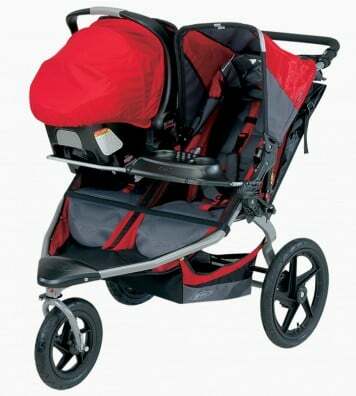 As almost every jogger and double stroller this one also is quite big even when folded. It’s folded dimensions are: 30.5” x 17.5” x 40”. BOB Revolution FLEX Duallie Stroller may be difficult to store in a small car trunk. It is definitely easier to fit it in a car trunk of SUV style hatchback, than trunk in a sedan (it may fit in lengthwise, but not in height). Probably you won’t mind folding and putting it to the car trunk when you want to jog in a wooded trails couple miles from your home few times a week, but I guess it would be annoying to take it in and out of your car 3 or 4 times a day, if you would like to go for a shopping or meet your best friend for lunch and run some errands. Besides, it will be definitely difficult to travel with this stroller in public transportation. It could annoy other passengers as it is quite long and takes up a lot of space. This stroller is for sure very maneuverable but also large and it will be hard to navigate through shop alleys without bumping into some stands. But remember, this stroller is designed for running and strolling on toughest terrain. If you are looking for heavy duty stroller for city use, BOB Revolution CE (City Edition) would meet your needs better. 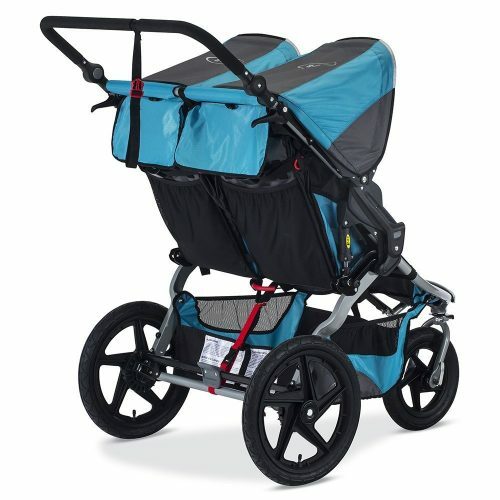 As for a jogging stroller, BOB Revolution Flex Duallie offers pretty wide range of colors. It is available in 5 color versions: Black, Red, Canyon (orange), Lagoon and Meadow. Keep in mind that some of the colors are available only at selected retailers and of course the price may very for each version. In my opinion the Lagoon looks really awesome and personally I would go for this version. By clicking here you can check all available color versions and compare their prices. To sum up my review of BOB Revolution FLEX Duallie Stroller I put the most important assets and drawbacks in the table. City Mini GT Double Stroller is quite an investment, but it doesn’t comes with any accessories for parents and babies convenience. There is a lot of extra gear that you can purchase separately. BOB Handlebar Console for parents – It is equipped with two cup holders and handy place where you can keep your stuff like phone or keys and have quick access to them. BOB Dual Snack Tray – It gives your children a place to keep their sippy cups, juices and snacks. BOB Weather Shield – Thanks to this cover your babies will stay dry and warm if the rain or strong wind surprise you during your jogging session. Great thing is that it doesn’t block children view. BOB Sun Shield – It protects baby from harmful UVA/UVB rays, wind and insects. If you live in a hot climate, this cover will be very useful. The frame has a five-year limited warranty and other components and fabric have one-year warranty. You can read more about the warranty on BOB’s official website. 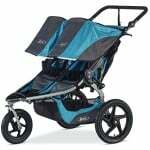 BOB Revolution FLEX Duallie is not the cheapest stroller for jogging, but in this case larger price tag does buy you better quality product. This stroller is made of durable materials and will serve you for a long time, until your children will be to big for it! 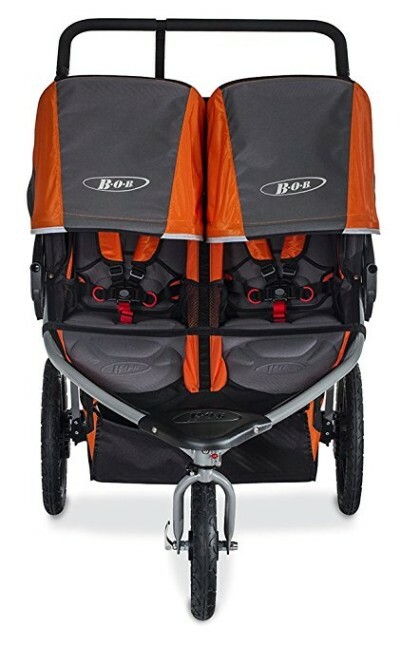 If you want to go for a run or hike with your babies you won’t find better stroller than BOB models. They give the best quality for a reasonable price. 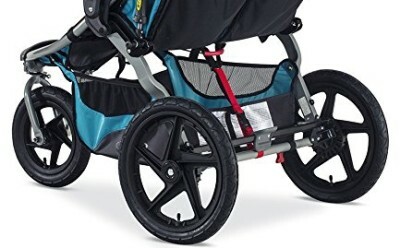 I would recommend you purchasing this stroller from a seller approved by BOB (like Amazon) because it ensures you will get the original product with warranty. If you want to check the price and available discounts for FLEX Duallie on Amazon click here. 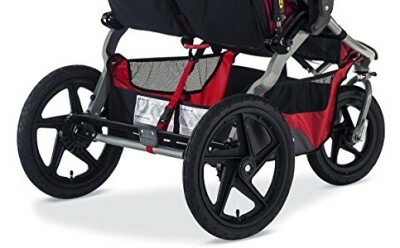 This stroller is one of the best selling double joggers. I checked it on Amazon and it has hundreds of positive reviews! What features parents praise the most and what they complain about? According to other customers this stroller is really well balanced, so you can run with it with two kids of different age and weight. It provides smooth ride which many parents consider as the most important feature. Another advantage is one-hand pushing and steering. It turns on a dime. Customers also say that running with FLEX Duallie is a breeze as you don’t feel any weight. Some parents use this stroller even for shopping! They also love how big storage space it has. Few moms mention this stroller helped them to succeed at weight loss. Parents also praise its high-quality and durability. The main downsize, according to other parents, is the size and weight. This “beast” takes up a lot of space in the car trunk (some parents recommend taking off the wheels which is not that hard). Taking it in and out is pretty annoying. However, even those parents who complain it’s bulky, agree this stroller is totally worth it. Another disadvantage is lack of accessories which means you have to spend extra money for example on parent console. Few parents mention that the sunshades are a bit flimsy and not always stay in place when fully extended. However, other parents didn’t complain about the canopies at all. Do you want to read more reviews written by parents who use this stroller? BOB Revolution FLEX Duallie is definitely a great stroller for active parents, who would like to keep up their outdoor lifestyle with their little children. This stroller is heavy duty, very functional and nicely designed! 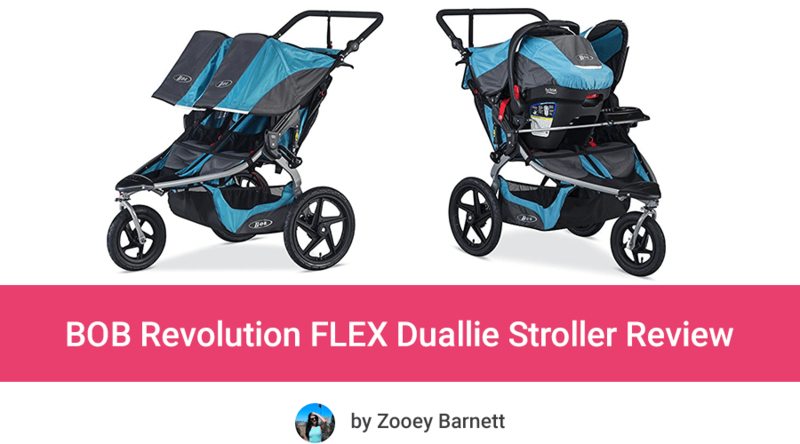 BOB Revolution FLEX Duallie Stroller is heavy and big – it is a double jogger that can hold up to 100 lbs and handles most challenging terrain! It’s not design for trips to the mall, but for off-road cruises. If live in an urban area, have to carry the stroller up the stairs and your strolls are limited mostly to sidewalks, grocery shops or the mall, you should look for something less bulky (for example Mountain Buggy Duet – here is my review). 1. When it comes to your baby’s safety and comfort you want to choose THE BEST products and avoid spine disorders and other healthy problems. You can do this thanks to BOB Revolution FLEX Duallie cozy seats and amazing suspension that cushions the ride. 2. This stroller is perfect for parents who live in rural area or parents who want to keep up their active lifestyle with their babies. It works best for outdoor activity, because it glides smoothly over any type of terrain. 3. FLEX Duallie gives you excellent opportunity to lose weight after pregnancy or just get back into shape without sacrificing spending time with children. Are you thinking about buying this double jogger? Remember to read customers reviews to see if this stroller meets your needs and check available discounts on Amazon.